On Thursday, August 14, 2008, God called Darlene Wilson Fortune Rollins home and relieved her of all pain and suffering. Darlene was born on December 24, 1947 (the 11th of 17 children) to Jannie and Eleanor Fortune. She was baptized at an early age at Mt. Olive Baptist Church, Hustle under the leadership of Rev. W.A. Young. Darlene was a faithful member at this church. She served on the Usher Board and the Kitchen committee for many years until she moved to Atlanta Ga., in 1991. On her visits back home, she would always make it a point to attend church. Darlene was educated in the Essex County Public School system. She graduated in the class of 1967. 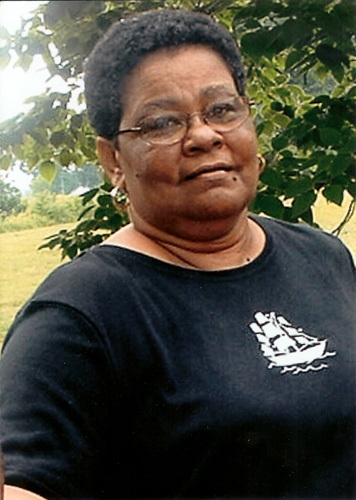 She was employed by White Packing Company in King George, VA for 20 years. Darlene was also employed at Nally's Chevrolet in Atlanta, GA until her health began to fail her. On June 7, 1986, Darlene was united in holy matrimony to Theodore Rollins. They shared 22 beautiful years together. Although Darlene did not have any children of her own, she loved her nieces and nephews as if they were her own. She had a very special place in her heart especially for her nieces, Doris Samuel Gaskins and Joan Reynolds Howard. She was blessed to have her niece Doreen Coleman and her husband Anthony and their children near. They were devoted to her and Theodore to the end. Darlene leaves to cherish fond memories, her devoted husband: Theodore Rollins, a stepdaughter Christina Rollins, three God children: Crystal Ball, Demitrious Howard and Cierra Rollins. Seven brothers and four sisters: Alberta (Barnett) Harrison, Emma Henry, Cordelia Myers, all of Hustle, Va., Carolyn Vessells of Newport News, Va., Randoulph (Donna) of Adelphia, Md., Phillip of Hampton, Robert (Gloria), James (Doris), Jannie (Dale) William and Walker all of Hustle. One Aunt: Thelma Louise Young of Hustle. A host of nieces and nephews. Three sister-in-laws, one very devoted (Beverly), five brother-in-laws. Many friends, four devoted, Antionette Pompey of Hustle Brenda Allen, Mrs. Elizabeth Harper of Atlanta, GA and Pauline Fields of King George, Va. A host of cousins, other relatives and friends. We will miss you Darlene, you surely was one in a million. You were a great wife, sister, aunt and friend.